ACORN stands for Accessible Campus Online Resource Network. For students, ACORN will replace the existing ROSI Student Web Service (SWS). 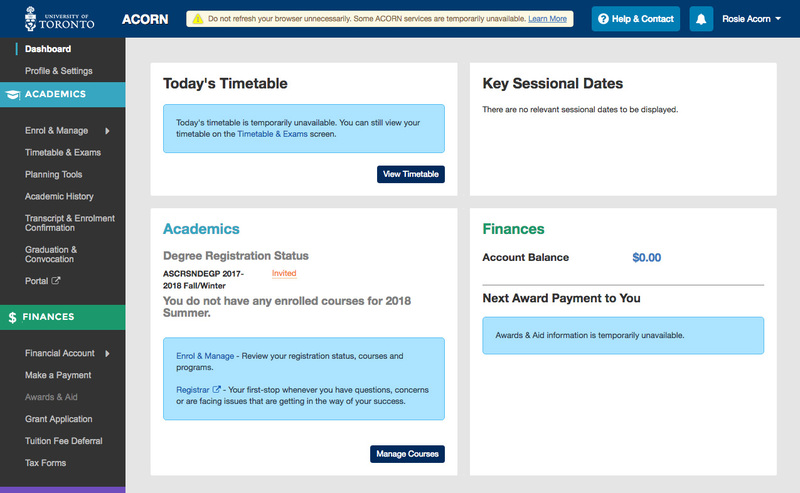 For those unfamiliar with the existing system, it’s where students enrol in courses, check fees and finances and do other records and registration tasks such as making updates to address and contact information.The purpose of ACORN is to provide a more convenient, personalized and guided experience for students using U of T’s online services. What changes and improvements can I expect in ACORN? Housing, getting involved (Co-Curricular Record, clubs etc), international opportunities, jobs and career planning, health and wellness and accessibility. Integrating information and providing easy connections to other complimentary online services and systems such as Degree Explorer, Blackboard Portal, Co-Curricular Record and the Career Learning Network. Personalized notifications for upcoming important deadlines, prompts for to take action (pay fees), and confirmations of actions occurring outside of the ACORN system (payment processed, grades posted). What’s the most useful thing that’s been added to ACORN? It really depends on your needs and goals as a student. Based on student feedback to date in our usability and beta tests, most students have found the new enrolment cart and enhanced autocomplete course search to be the most useful features in ACORN. Your enrolment cart is used to plan ahead of time the courses and activity sections you intend to enrol in later. Feel free to add to your cart different back-up course section combinations, or add entirely different courses in case they become necessary. Note: Courses in your enrolment cart will not automatically be enrolled in once your enrolment period begins. Learn more about how to Add courses to your enrolment cart. Does ACORN have scheduled downtime like ROSI did? Yes, but significantly less than in ROSI previously. Scheduled downtime will be weekly on Monday mornings from 3:00 am – 6:00 am EST. How was the name ACORN chosen? The Office of Vice-Provost, Students ran a contest in early 2012 called “Name the New ROSI”. The winning entry submitted by a student in the Doctor of Dental Surgery (DDS) program was announced on April 18th, 2012. The name was selected because of its simplicity and the acronym ties to U of T’s logo oak imagery. The adjudication panel for the Name the New ROSI Contest met in early April and reviewed the nearly 1000 entries for the contest. Submissions were received from undergraduate and graduate students representing a range of programs from across the University’s three campuses. How do I contact the ACORN Team? If you have a question, bug report or feedback for the ACORN team, you can reach out to us within ACORN. To reach us, click or tap the “Help & Contact” button on the upper right corner of any page in ACORN. 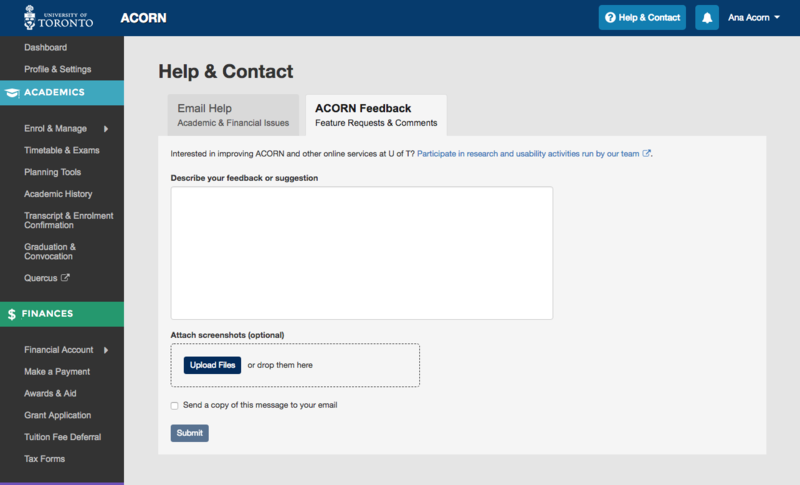 If you want to contact the ACORN team, go to the ACORN Feedback tab. You should contact us if you have a question or comment for our team, want to report a bug or other issue with ACORN, or have any ideas for improvements within ACORN. Please attach screenshots if you are submitting a bug report or issue. If you require academic advice or have questions about course and program enrolment or your registration status, your Registrar’s Office should be able to help you. You can reach them by going to the Email Help tab and selecting their office. Your Registrar is usually your first stop when it comes to academic matters at the University. Are there any opportunities to contribute to the programming or design side of ACORN? Yes! 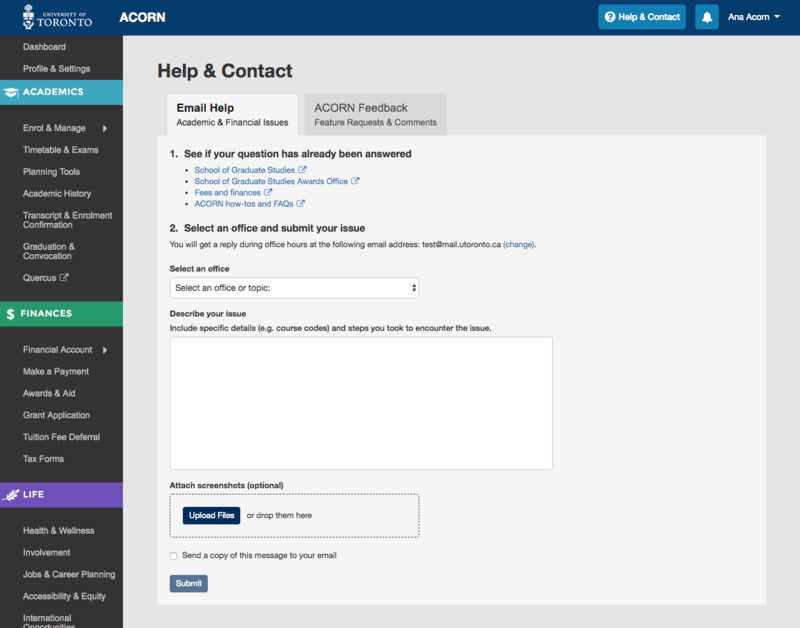 The ACORN User Experience Design Team works with many students at U of T from various academic backgrounds to help make ACORN and other online tools better. To become a part of the ACORN Student Advisory Team, learn more and sign up on this website if you are interested. We often hold usability tests in our User Experience Design lab at 215 Huron street. During these 30-45 minute tests, we invite U of T students to come in and test new designs and features that are in the works. It’s an opportunity for you to see what the ACORN team is currently working on, learn about our UX design process, and it also gives us a chance to meet you and find out how we can improve ACORN to make your student life easier. If you participate in 5 sessions, you’ll also get a credit on your Co-Curricular Record (CCR)! We do hire work-study students from time to time, and when positions are available you can find them on the Career Learning Network (CLN). What will happen if I enrol in courses that result in a timetable conflict? ACORN will not take any additional actions if you enrol in courses that result in a conflict (i.e it will not drop any course activities on your behalf). It is up to you to resolve any conflicts. You can either leave the courses as they are or enrol in alternative options. Which browsers are supported by ACORN? What is ACORN’s Peak Load Mode? ACORN’s Peak Load Mode is a simplified version of ACORN that is enabled on peak enrolment days to reduce load on the system and improve performance. An example of a peak enrolment day is when priority course enrolment controls are removed for Arts and Science courses on August 4th for the 2017-2018 academic year. The ACORN team will announce these dates ahead of time. Note: When peak load mode is active, please do not refresh your browser while your course enrolment actions (e.g. enrol, switch section, drop) are in progress, or take the same enrolment actions in multiple browser tabs. ACORN will currently be under peak load, so enrolment actions will take longer than usual to complete, but are in progress even if the system is slow to respond. Refreshing your browser or repeatedly requesting the same action will only slow the system down further and increase the likelihood of your request being rejected entirely. Why are some of ACORN’s services temporarily disabled? Due to the high volume of traffic during key enrolment days, the ACORN team has temporarily disabled some ACORN features not essential to course and program enrolment to reduce the load on the system and its supporting infrastructure. What features and information are disabled or unavailable during peak load periods? Note: All functionality required for course and program enrolment is available. When will full functionality be restored? ACORN’s “Peak Load Mode” will only be enabled on isolated high-traffic dates. Regular functionality will be restored within 24 hours. Please email us at rosi.help@utoronto.ca if you have any questions or comments. What happened to ROSI now that ACORN has launched? ROSI has been renamed to “ROSI Alumni Transcripts“, and is now used by alumni to view their academic history, request transcripts and reset their ROSI PIN. 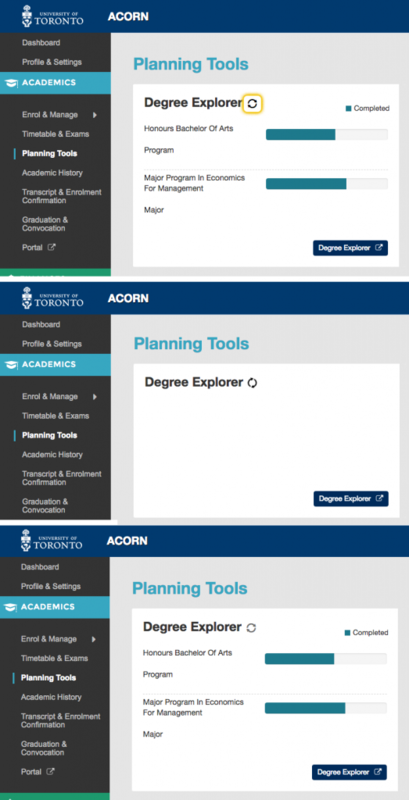 Current U of T students only use ACORN. Where can I find out more about ACORN? If you are still curious to learn more about ACORN and haven’t found what you are looking for here or on the Introducing ACORN site, feel free to contact the ACORN team via the “ACORN Feedback” tab on the Help & Contact page within ACORN. Find information and resources for various services that your campus offers regarding your health and safety. Learn about extra-curricular activities that you can participate in through the Co-Curricular Record (CCR), student organizations, clubs, mentorship programs and more. This screen provides information on part-time jobs, volunteer opportunities, programs, workshops and services to help you prepare for your career and earn money while you study. Learn about services available for students who require assistance or information regarding accessibility and equity at the university. Learn about the Centre for International Experience, explore international study and research opportunities and keep up-to-date with travel advisories. Here you can find information on housing advertisements, finding roommates, and applying for on-campus residence. If you require care for a child, adult or senior family member, this page will direct you to the appropriate services at the university. What is the Financial Planning Calculator? The Financial Planning Calculator is an online tool that will help you estimate what it will cost to attend the University of Toronto for one academic year. It will be coming to ACORN in the future, but at the moment it is a standalone publicly-available tool. Who can use it? Anybody who wants to learn more about costs associated with attending U of T. This includes current U of T undergraduate, graduate and second-entry students, prospective students (high school and potential transfer students), parents, staff or guidance counsellors. This is purely an exploratory planning tool for you to use; any information you enter will not be associated with you or your financial status at the University. Learn how to use the Financial Planning Calculator. Where do the expenses in the Financial Planning Calculator come from? The Financial Planning Calculator is meant to provide a quick way to approximate what the upcoming academic year will cost, so many of the expenses used are educated estimates or averaged values. Costs for off-campus housing, groceries, entertainment and personal care are based on typical costs of living and eating healthy in Toronto, while tuition, on-campus housing, transportation and meal plan costs are calculated by drawing from more precise data provided by the University and current public transit prices. What is a Confirmation of Enrolment letter? A Confirmation of Enrolment letter is an official document that can be used to verify your status as a student at U of T. If you are a Faculty of Arts & Science student, you can download a Confirmation of Enrolment letter in PDF format via ACORN by visiting the Transcripts & Enrolment Confirmation page. If your faculty does not provide these letters via ACORN, please contact your registrar to get a Confirmation of Enrolment letter. Learn how to generate a Confirmation of Enrolment letter. What do I do if the Confirmation of Enrolment letter I generated in ACORN doesn’t contain all the information I need? Since the letter is automatically generated using your registration information within ACORN, there are limitations with the information we are able to include. If you need a letter that is more customized than what ACORN offers, please request one from your registrar. What do I do if I want my Confirmation of Enrolment letter to include a different graduation date, or if it doesn’t give me the option to include it at all? ACORN does its best to predict when you might be graduating, plus or minus one year. It can only do this accurately if you are a full-time student. If ACORN does not have all the information it needs to make an accurate prediction for any other reason, you will unfortunately not be able to include your graduation date in the letter. Please request one from your registrar in this case. I don’t see a button to generate a Confirmation of Enrolment Letter; what do I do? If you don’t see a button or a blue message on the Transcript & Enrolment Confirmation page asking you to contact your Registrar for a letter, this means you are currently not invited to register or registered in a current or upcoming session. Please check back once you are registered or invited to register, and you should be able to generate a letter as long as your faculty allows their students to generate letters via ACORN. In the meantime, please contact your registrar to get a letter. If your degree and program progress in the Planning Tools section appears to be out of date, try clicking the “Refresh” icon next to the “Degree Explorer” heading. This will fetch the most up-to-date data about your academic progress. If this doesn’t solve your issue and you think there may be a larger problem, please contact your Registrar and they should be able to help. The process of refreshing your Degree Explorer information. After clicking the “Refresh” icon, the information will take a second to load, and then will be up to date. How do I log in to ACORN? Similar to other U of T systems like Blackboard Portal or Degree Explorer, you will use your UTORid and password to log in to ACORN. Will I still need my ROSI login PIN? If you choose to continue using ROSI during the transition period to ACORN, you will still be required to use Student Number & PIN to login. ACORN will be using UTORid. Why is ACORN using UTORid for login instead of ROSI’s PIN? Will the invoice or other financial screens be improved? Eventually yes, but not in the initial release. The finances module on ACORN is slated for redesign in the second phase of work which is already underway. We tackled as much as we could with the first phase of ACORN and are looking forward to rolling out additional enhancements ongoing. Is ACORN optimized for mobile? Will there be an app? In its first release, ACORN was optimized only for a tablet and desktop setup. We have since released an optimized responsive version of ACORN for smartphones that can be accessed without downloading an app. Can I contribute to future ACORN project work? We have been fortunate to have over 1000 students involved in ACORN to date through interviews, surveys, usabilty tests of early stage prototypes and beta tests of our test site. If you would like to participate in future activities, please complete and submit our sign-up form. We’ll email you for opportunities to get involved as they arrive, typically once per month, give or take. Is there an official U of T tool that can help me map out my timetable? Yes! 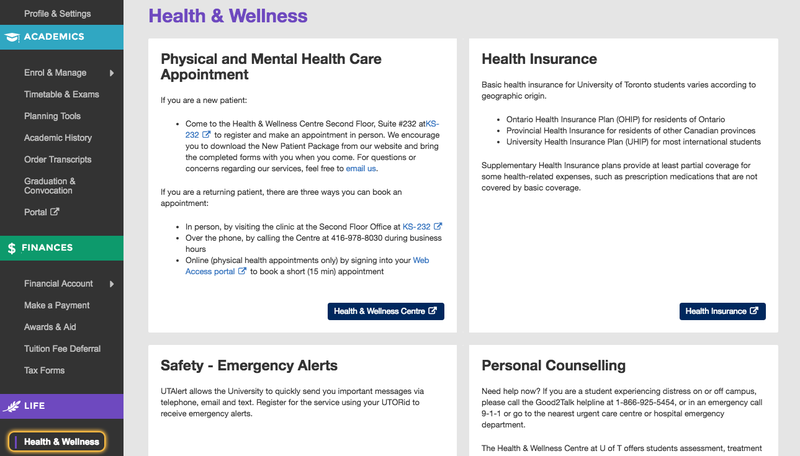 An official Timetable Builder is currently available for UTSC students. In the future we will be branching out to include additional faculties, so stay tuned for more information.